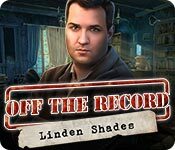 Off the Record: Linden Shades is rated 3.6 out of 5 by 32. Rated 4 out of 5 by tutortime from Great game. I really liked playing this game. It had a great story line and interesting scenes to interact in. The mini games were not too difficult and I completed the game quickly. Rated 4 out of 5 by DiDi212 from Fun and Easy. This review is based on completion of the SE in the most casual mode. It's not a very long game, as it is so very easy. I never got lost. There are many HOS and a few puzzles, so if you're really not into lots of HOS you won't like this game. The sound and visuals are great. Lifelike actors are used which adds some credibility to the game and of course they have great voice overs. The hint button recharges quickly and works outside the HOS with directional arrows or zooming into the object of the hunt. The HOS are typical junk piles with very clear objects. 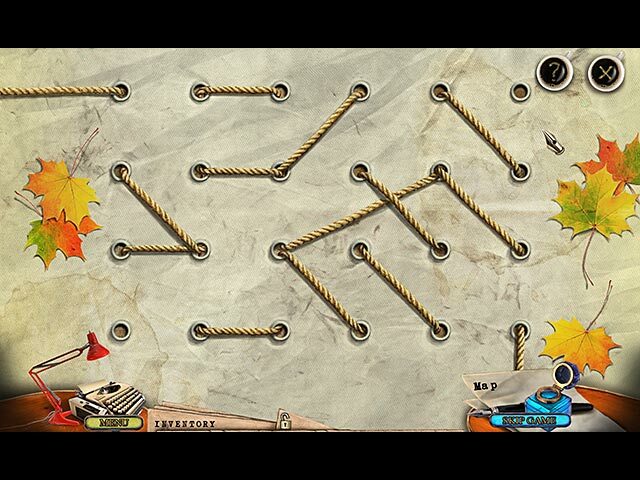 The puzzles are typical and easy with a quick skip button. There is a walk through, but I don't think you'll need it unless you have trouble with a puzzle. Using the walk through can teach a newbie how to work the puzzle. This game is not very challenging, but it's nice to play a game that flows and things are easy to find. I thought the story line was very good. I really couldn't wait to find out who was in the red cape and exactly what was going on. The story really flowed. I'm glad I bought this game. Read some reviews and play the demo to make an informed decision. Rated 4 out of 5 by LunaNik from Brilliant storyline, enjoyable gameplay TITLE Off the Record: Linden Shades Standard Edition full game DEVELOPER Eipix Entertainment (produced by BFG) GENRE Interactive Hidden Object Puzzle Adventure scary mystery STORY Linden Shades was once an unusual orphanage, a place where the children were happy and the staff was caring. Then the children began drawing images of a blood red ghost, and Linden Shades became a frightening place for everyone. The principal was certain someone was responsible, but the police were no help, even when she had proof. Decades later, your editor offers you the chance to solve the mystery of Linden Shades. He believed the principal, but his career drew him away from the orphanage and the enigma remained unsolved. Are you brave enough to explore an abandoned orphanage? Can you reveal what happened at Linden Shades? Or will the blood red ghost frighten you away? GAMEPLAY Lots of HOs with simple interactions, including many where you zoom in to place items into a case (like chocolates into a box). Many people had technical issues with this, including me, until I discovered you must click and drag the items into the case. If you just click on them, they disappear and you cannot progress. Just a heads up. Puzzles are familiar and relatively easy: spot the differences, restore the image by swapping pieces, turn on all the lights, etc. The beauty of Linden Shades is in the way the story unfolds through the game. There are moments that will startle/frighten you, so this isn't one for the kids. INTERFACE ? Map - shows active areas and transports ? Journal - gathers clues and tracks storyline ? Hint - identifies object in iHOs, I didn't use in adventure mode ? Lockable Inventory ? Black Bar Tips - gives clues in casual mode ? Other - collect the principal's cassette tape diary to learn the story SETTINGS ? Sound Effects Volume ? Music Volume ? Voiceover Volume ? Fullscreen ? Widescreen ? Aspect Ratio ? Custom Cursor ? Toggle Active Area Sparkles ? Toggle Navigation Sparkles 3 Difficulty Modes GRAPHICS & ANIMATION Cutscenes were done with live actors…and well done at that. In game animation was smooth and characters were well drawn. Background graphics were beautifully textural and moody. Objects were well rendered and clearly recognizable. MUSIC & SOUND & VOICEOVERS The music was suitably creepy, but a bit repetitive. I would have like more ambient sounds…creaking doors and the like. Voiceovers were excellent. ANALYSIS Excellent storyline-driven game. I played through without a break. It was not a long game (perhaps the CE is longer), but still well worth the SE price, IMO. Enjoyable gameplay, although a touch heavy on the HOs, though many will like that aspect. Rated 4 out of 5 by watervalleygal from Fun game to play! Just finished playing this game and thought it to be well done although it played very fast. The ho's were plentiful and the graphics were very well done. The other puzzles were varied enough to hold your interest. The use of live actors and the voice over made for a game that was out of the ordinary Glad I purchased it, thank you Big Fish game team. Rated 4 out of 5 by pennmom36 from WATCH OUT FOR THE BOOGYMAN! An investigator's first assignment is to find out what was haunting the children at the Linden Shades orphanage, a red boogyman that was so scary they abandoned the beautiful estate! The cutscenes are very well done with real actors, but some are horrible actors. This is a very easy game to play but quite enjoyable, bright and sunny yet still a bit of spooky thrown in. There are a lot of HOS and within each is a mini game such as finding and putting tools back into their correct spots. The mini games are easy as well such as spotting the differences between two alike photos or changing the color of a pie chart to all blue by clicking on one button that moves one space clockwise the other button moves two counterclockwise. There is an interactive map and a good hint system but most of the tasks are easily figured out and it is easy to figure out where to use your inventory items. Rated 4 out of 5 by neilskinut from A really good game that is worth playing Great game with lots going on. The graphics are great. Good music and voice over. Pretty good storyline that keeps you interested in wanting to keep playing. The HOS are good and some are interactive. Pretty straight forward and easy. The puzzles are also good. Some easy some needs some thought. Most are easy. There are lots of achievements and things to find in the CE and not in this one. The hint button works good and not too slow to recharge. Just a fun game, you will love it. Which one do you get the CE or SE? This one is good but easy. Both have great graphics and music. Both have voice over. I got the CE. Rated 4 out of 5 by Nilosh from Great for HOG Fans! I actually missed the CE version of this game due to my absence and had a chance to play it only today. The difference between the two versions is that with the SE version you get no extras including the series of collectables and achievements. Bonus section also gives you extra HO scenes to play along with mini-games. I loved the graphics, real actors, live footages with great art-work. Wonderful use of colors and there is the creep factor which I loved. Voice overs are nicely done and the music adds suspense to the story. There are three modes to choose from and you can change your level of difficulty as you play. Sparkles are totaly eliminated in the Insane level. You have a journal and a map. As our story begins, you take on the role of a journalist who is sent out to investigate an old case of an orphanage that was shut down due to rumours of a haunting. A mysterious red figure had terrorized the children and now you need to unravel the mystery. HO fans will love this game as there are plenty of them throughout the game. All were interactive and easy to play. Adventure whereby you collect your inventory items and work your way around the orphanage and surroundings. I enjoyed the mini-games, mostly easy but had a fun factor to them. If like me, you enjoy collecting paticular items ( three sets in the CE version) and gunning for achievements, then you are better off with the CE which I believe scored high with many gamers. Although not very challenging to play and a bit on the short side, this version is pretty straight forward but the story line and visuals are quite captivating. It really comes down to budget but I do recommend you wait for a CE sale of some sort to get the latter. Rated 4 out of 5 by rosekaufmann from FAST-PACED GAME Found this game to be quite wonderful - a pleasant surprise considering I was expecting average. You are a new reporter who has been sent by her editor to investigate a supposedly haunted orphanage which has been closed. Its former inhabitants claimed to see bloody red ghosts floating around. But it's not really bloody - more of a ghost story you told as kids at camp. Story and gameplay are fairly fast paced and quite enjoyable. This is a buy for me. 3 modes of play. Voice overs and actors are very, very good. Map shows where there are areas with outstanding activities. Journal shows your objectives and the evidence collected. Good ratio of HOS to puzzles. The puzzles are not too difficult, although I had to think a bit on what to do for a couple of them. I didn't find any instructions, but maybe I just missed them. The HOS were lists of distinctly detailed objects that were not too difficult to find and the scenes weren't unnecessarily crowded. Rated 3 out of 5 by SockTrollQueen from It was okay. After playing the demo, I can't say I am exactly overwhelmed with the desire to purchase. I am curious to see where the story goes, but not enough to buy. The puzzles are mostly repetitive based on the few I played. The graphics are fine. The music not really enough to give the atmosphere they want to convey (in my opinion). A lot of the negative reviews are a bit harsh. I won't say it was horrible because it isn't a bad game, just not one for my skill level (not challenging enough). I would suggest it for beginners. Try the demo. Rated 3 out of 5 by taragirl28 from Not Bad, But A Bit Short! The game was okay for me. The puzzles were easy, and sometimes fun. The HOG were a bit too frequent for me though. The graphics were okay, using a mix of real people and fake. The only real issue I have is the length. It was VERY short for my taste. There is a map, and its interactive if you choose. There is a lock for your inventory, which I need! All in all , not too bad. Happy gaming gamers!! Rated 3 out of 5 by Carussel from Off the Record Again, one of the usual HO games. Good graphics, easy tasks, simple puzzles (too easy for me). The story is coherent but not more. Nothing unusual, I expected more. Rated 3 out of 5 by dancemom1 from Just OK! Pretty much the same review as what I gave for the CE version. Graphics aren't bad, but nothing special, and a bit old school. Game play is nice. Music was very annoying. HOGs are fairly clean and items are very easy to find. Hint is helpful and fills quickly. There are a lot of achievements in this one and a lot of items to find (not sure what they do for you, but you find them anyway). This game is quite simple and there is no challenge at all. It is a nice game for a beginner, or someone who just wants a no brainer day, which I do occasionally. I wasn't excited about the CE and really haven't changed my mind about the SE. To me, it is just too boring and I lost interest in playing any further, so no buy for me. A game has to be extremely bad for me not to recommend to others. As always, try it for yourself and see what you think. We all have different tastes in games and you may find this one quite enjoyable. Thanks for the reviews. 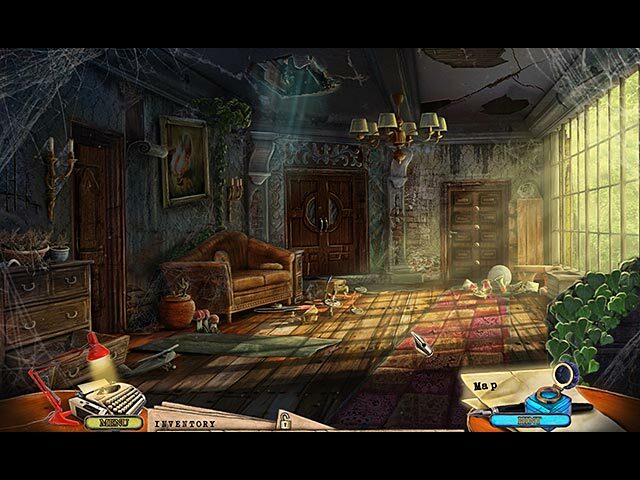 Rated 3 out of 5 by sportygal2009 from My Opinion Hasn't Changed - Not Eerie/Creepy Enough - Review Of Completed Game HOPA (Hidden Object Puzzle Adventure) Story: Your news editor sends you off to Linden Shades to look around a now long ago abandoned orphanage rumored to be haunted by the red hooded boogeyman The editor had once investigated the story but never had a chance to bring it to any conclusion cause he ended up getting assigned a different case. 7 Chapters along with 7 cassette tapes to be found throughout the game. I play all my games running on PC Windows 7 64 bit and this had widescreen for me. Filled my 20 inch monitor just fine. No tech issues. There are live actors in some cut scenes, otherwise voice overs. There are 3 modes of play. Regular, Expert, Insane. I tested out before I started actually playing. The easier two modes have sparkles/black bar tips, hint/skip quick on charge up. The Insane mode is really slow. Hint also helpful outside of HOS on all modes. If you are not in an area where there is something to do a portal box will come up and just click there and it will take you. You can switch between modes at any time during the game. I played on Insane mode and didn't use hints/skips once I actually started playing the game. Journal: This is the typewriter down at the bottom. Click on that and inside you will also find Objectives, Evidence. Map: Is transporter and shows where you are on the map for all play modes along with objectives which also pop up on the screen however the 2 harder modes don't show active task indicator at least it didn't for me. HOS: Found by word list and very interactive here and there are quite a few scenes. I didn't find these to be Sanford & Son junkyard. I thought these were very well done. I had no problem here locating anything. Puzzles: The usual run of the mill found in many games just to name a few: Get the cats and snails from one side to the other, get the emblem out of the maze, slider puzzle, etc. The challenge varied for me. Usually in most games I at least skip a couple however didn't skip any in this game. My overall impression: I purchased the CE and rated that 4 stars and the reasons were because it was on sale for $8.99 at the time and I enjoyed trying to earn/find the achievements, collectibles, and letters. I found that to have a lot to do however while the voice overs and live actors were really good along with the graphics but for an orphanage that is supposedly haunted by the red hooded boogeyman well past the intro to the game I didn't find the game eerie/creepy at all really. I also had my suspicions early into the game who the boogeyman was and confirmed for me by the half way point of the game. If this would of been $13.99 although it has the extras I would of skipped this and waited for the SE here and rated the CE 3 stars as well but because of sale I wanted to see where the game would take me. The main game here comes to a satisfactory conclusion. The bonus chapter not needed in my opinion unless of course you are interested in earning the achievements and finding the collectibles and letters cause those aren't included in the SE version here. No eerie/creepy feel to this bonus chapter either. As for the game length this would probably be about a 5 hour game for me. The CE was longer for me and that was because there was more to do. No complaints on the length though. So you take away the extras this is just an OK game in my opinion. Sorry but I don't get all the hype over this game. So overall I rate this 3 stars. Thanks Big Fish and developer. As always give it a whirl and decide for yourself. I still however recommend it. It looks like most really like this game and you may too however I wasn't that impressed with it. Rated 2 out of 5 by Mrs_Kim from A good story gone bad A game by Eipix ------------------------ Claimed as a spooky game by Eipix, this game has a lot of promise. However I have never seen Eipix presenting a dark game so I was doubtful at first. Only that I know their previous games: Myths of the Worlds and Final Cut series are ones of the best out there, I decided to give this game a try. Well I was wrong! There are 3 levels of difficulties. Although scary in the intro movie, it was at first and gradually it became just a regular game, which is a pity. I expect there will be ghosts or shadows pop out of nowhere in some scenes but it didnt happen. Instead we had to go around the farm, doing annoying tasks and lots of HOG before finally getting into the house! There are lotsss of HOG scenes here and annoying ones at that. By the time I got into the house the feeling of spookiness had gone and replaced with annoyance. Too bad, a game that should have been great but was ruined with the dev's too ambitious plan to make it scary. Well, better luck next time. Rated 2 out of 5 by Skeride from Good for children, disappointing and unpolished for adults I love the developer's other games, but (assuming they intended a teenage or adult audience) they really dropped the ball on this one. * While the game supports widescreen, at 1920x1080 the graphics were unacceptably pixellated. The edges of rounded objects were sawtoothed. * The list-based hidden object scenes were simplistic and only one step above rudimentary. - Many objects made no sense for the setting - example: the first scene had you find fresh, unmelted chocolates that had been sitting in the sun outside an orphanage abandoned since 1969. - As is standard for the genre, colored item names meant an extra step was needed. These extra steps seemed designed for toddlers: e.g. click on a jewelry box to zoom in and place variously shaped gems into the slots corresponding to the correct shape. - Annoyingly, some hidden (well, fragmented) objects had to be found scattered across the entire scene, a-la the old Gypsy Tower game. * The graphics were amateurish. It was blatantly obvious that a bunch of photographed items had been inexpertly clipped and then cut-and-pasted into the scene without regard to matching the lighting, coloring or tone of the rest of the setting. * The plot was presented as if it were geared towards adults, while being too simple for anyone beyond elementary school age. It honestly played out like a Scooby Doo episode, and not one of the good ones. * There was very little effort to make genre-standard gameplay (find odd-shaped keys to fit locks, find the scattered pieces of complicated puzzle locks and then assemble them, search through junk piles of improbable objects) fit the setting. This is a common pitfall of this type of games, but in this case the separation between gameplay and setting was jarring enough to destroy immersion. In short, this is a surprisingly weak entry from the developers behind the fantastic Final Cut games. It may be worth a purchase if you have a toddler or youngster you wish to introduce to hidden object games, but I can't imagine most adults playing the game on their own would find it worth their time. Rated 2 out of 5 by roaming from Maybe Okay For a Very New or Young Beginner There were too many annoyances for me. *The very large and completely unnecessary new objective/ objective completed box popping up all the time. *The music was just awful. *Teeny tiny objects to pick up outside of the HOS. *Busy artwork. That's the only way I can explain it. *Too easy. There's nothing left for the player to figure out. The story seemed to have potential, but the execution left a lot to be desired. I'm amazed that it has four stars at this point. It seems that people who don't like a game won't review it. Rated 1 out of 5 by CyndiLouWho2 from Actually a Game for Children or Teens Unless the other reviewers were children, I'm not sure how any game-playing adult could give this a high rating. I played the demo for an hour and was able to acquire 4 out of the 7 cassette tapes -- which tells me the game can't be very long. The storyline sounded inriquing, but it's geared more for children. It's not creepy or scary. There's no ominous music or things jumping out at you. It's very obvious all along that the "red ghost" the orphan children are seeing is actually a person in a red hooded cloak. The music and sound effects were okay, but the graphics looked more like sketches or drawings. 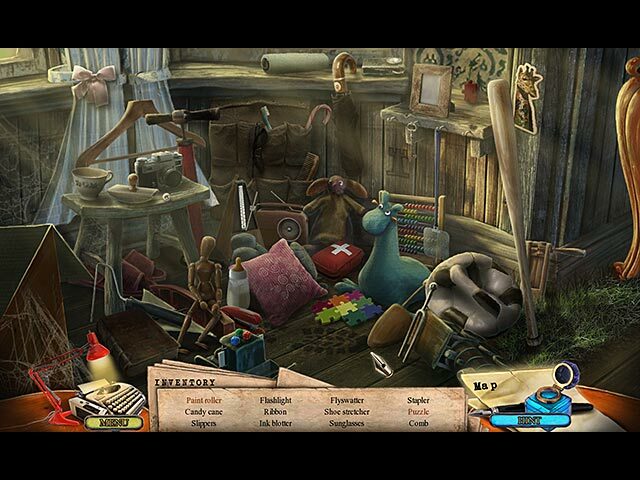 Puzzles are simple and the hidden object scenes are extremely basic and easy. The only thing I liked about the game was the was the video at the beginning and the great voiceovers. I would not recommend this game for adults unless they were new to computer gaming. And I wouldn't pay full price for it. Wait until it's offered as a Daily Deal or Catch of the Week. Something's driven everyone away from Linden Shades.